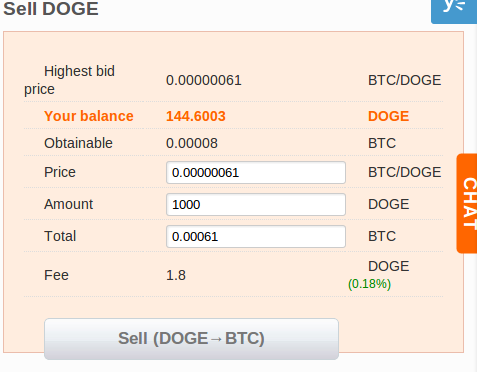 In Bter I created a sell offer with DOGE/BTC, it seems the calculation is wrong. They have not deducted the transaction fee. I have included 2 screen shots and anybody know the same or experience the same kindly clarify this. My question is Is transaction fee deducted in this transaction? That depends also on your BTC balance AFTER the sale. 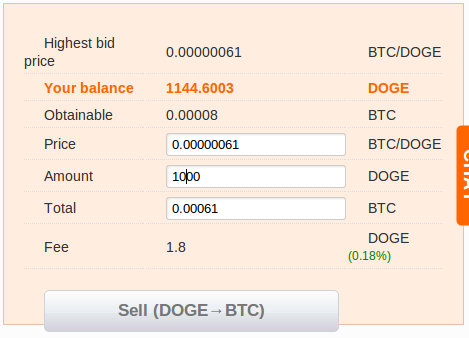 It seems that there is indeed 1000 DOGE subtracted from your balance, so that is correct. If there has been 0.00061 added to your BTC balance, then no fees have been deducted. If 0.00061*(1-0.0018) = 0.000608902 have been added to your BTC balance, then the fees have been deducted from your received currency. This is general behavior on exchanges. It is more user friendly to specify the exact amount of sold (and deducted from balance) and deduct the fee from the receiving currency. Not the answer you're looking for? Browse other questions tagged exchange-rate exchange-fees exchange-order bter or ask your own question. I deleted my windows google auth (TOTP), how can I log in on BTER without it?